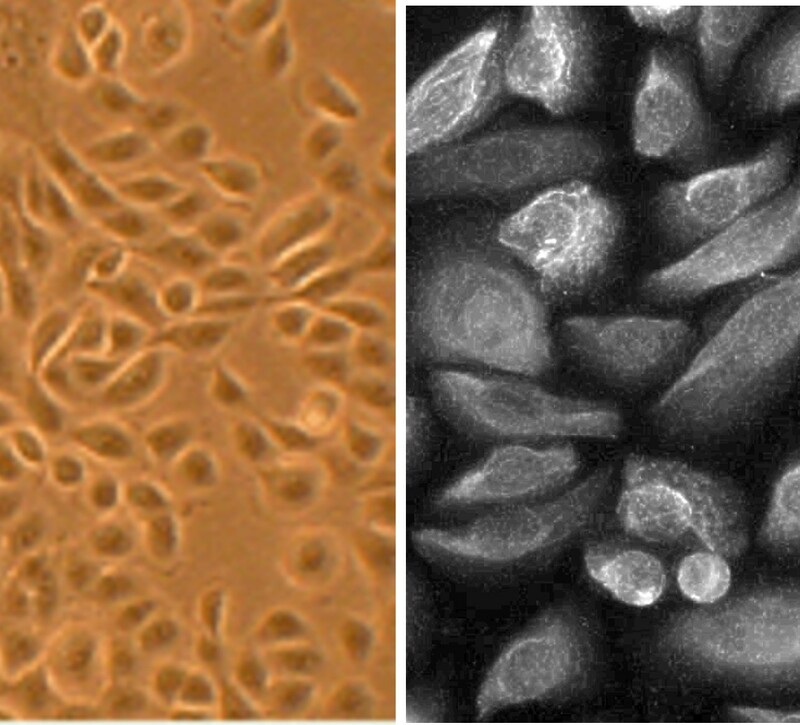 Human Prostate Epithelial Cells (HPrEpC) are isolated from normal human prostate and provide a useful tool for studying various aspects of pathology and biology of the human prostate epithelium in vitro. HPrEpC and Human Mammary Epithelial Cells (HMEpC), both from Cell Applications, Inc., have been used in a study demonstrating that TGF-b1 induces Smad 1/5/8 and Smad 2/3 phosphorylation and BMP signaling results only in Smad 1/5/8 phosphorylation in these primary epithelial cells, while in cancer cells BMP also elicits Smad2/3 activation, contributing to cancerogenesis. (Click to Enlarge) Human Prostate Epithelial Cells: HPrEpC (L). HPrEpC immunolabeled for cytokeratin 18 (R). Holtzhausen, A., C. Golzio, T. How, Y.-H. Lee, W.P. Schiemann, N. Katsanis, and G.C. Blobe. 2013. Novel bone morphogenetic protein signaling through Smad2 and Smad3 to regulate cancer progression and development. The FASEB Journal. 28:1-20.